COUNTDOWN TO NEW YEAR’S EVE (with balloon drop!) – at the Bowers Kidseum. New Year’s Eve isn’t just for adults – kids can celebrate too at the Bowers Kidseum! Ring in 2014 at a daytime celebration with family, friends, and fun for everyone. Wear party hats, make noise with craft-festive noisemakers, and join in the fun with our drumming circle! Write down your New Year’s resolution, then get ready for an exciting countdown to a colorful balloon drop at 1:30 PM, complete with sparkling cider and fresh, gooey cookies. Happy New Year to all! For more information, please visit Kidseum or contact kidseum@bowers.org. Discovery Science Center Presents: NoonYears Eve, December 30 & 31, 2013. Ring in 2014 like a Hollywood superhero! Dress as your favorite superhero and celebrate the New Year with us at noon with Hollywood themed activities for the whole family. LOCATION: Discovery Science Center, at 2500 N. Main St., in Santa Ana. INFORMATION: 714-542-2823. KROQ & Observatory presents New Year’s Eve Capital Cities. Tuesday, Dec 31, 2013, 8:00 pm. Open to all ages. $50 Early Bird General Admission, $85 VIP Section & Buffet, $150 Open Bar & VIP Ticket (for 21+ only). Buy tickets. New Year’s Eve Dinner and Party at Bistro 400. Four Course Dinner, Champagne Toast, Confetti Cannon, Live D.J. $40 per person plus taxes and gratuity. Located at 400 W. 4th Street, in Santa Ana. New Year’s Eve Party at Original Mike’s. Dinner includes Chicken, Steak or Salmon, dessert and champagne, for $50. Live on Stage – Balance. Doors open at 8 pm. Tickets must be reserved at the restaurant. Phone (714) 550-7764. Email events@originalmikes.com. Website http://www.originalmikes.com. Located at 100 South Main St., in Santa Ana. New Year’s Eve Glow Party at The Copper Door. No cover charge! Free glow sticks, confetti cannons, NYE Toast. Find out about our NYE VIP access, so you can jump the line by emailing: guestlist@thecopperdoorbar.com. Located at 225 1/2 N. Broadway, in Santa Ana. 7th Annual PROOF NYE EXTRAVAGANZA at Proof Bar. 2014 New Years- Black & White Theme. $10 Presale/$15 Night of the event. Out with the old and in with the new! We have invited all of your favorite Friday & Saturday night resident DJS to provide you with the soundtrack for an evening to remember. DJs: Concrete, Official, GMO & Cancun Joey, Rated Ar, & Bob Gnarley. Dress code is New Years appropriate. If you have any questions, please call the bar during business hours of 4pm-2am nightly @ 714.953.2660. Complimentary Midnight Toast, party favors, a special appearance by Baby New Year, and much more. $10 PRESALE tickets available at the bar or email to info@proofbar.com for guest list. The Crosby Presents: Cruise to the Future *NYE!! Tuesday, December 31, 2013 at 10:00pm. We’re all on our way to a fun filled future with hover boards, flying cars, multipurpose jackets and more.. Roll through The Crosby this New Years Eve to Celebrate!! Sounds provided by: Kill Will, Fluent One, Tea Long, FTR. Food + Drink service all night, Futuristic Visuals, 21+No Cover, Specials! Located at 400 N. Broadway, Santa Ana. New Year’s Eve Dinner at The Little Sparrow. Chef Eric Samaniego will be preparing a special tribute to the late Charlie Trotter. First Seating – 5 Course Chef’s Tasting Menu $95. Reservations available at 5:30, 5:45, 6:00, 6:15, and 6:30. Late Seating – 7 Course Chef’s Tasting Menu with Midnight Champagne Toast, $105. Reservations available at 8:30, 8:45, 9:00, 9:15, and 9:30. Reserve online here, or call 714-265-7640. Located at 300 N. Main St., in Santa Ana. New Year’s Eve Menus. NYE @ The Playground 2.0. December 31, 2013 @ 6:00 pm – January 1, 2014 @ 12:00 am. Tuesday // December 31 // 6 pm and 10 pm. $200 including food, pairings, tax, tip. To ring in the new year were going all out at 2.0. We’re cooking up all our favorite dishes of 2013. Some of the dishes are inspired by meals had elsewhere, the others are the dishes we are most proud of. Join us New Year’s Eve, at 6pm or 10pm. Tickets are $200 per person and all inclusive. Located at 220 East 4th Street in Santa Ana. Phone: (714) 560-4444. Click here to make your reservation. Join Morton’s Steakhouse on New Year’s Eve! Tuesday, December 31. Join us for an evening to remember…with fine food, good company and holiday cheer! Make your reservation online or call 714-444-4834 to get the best availability. Located at South Coast Plaza Village at 1641 W. Sunflower Ave., in Santa Ana. 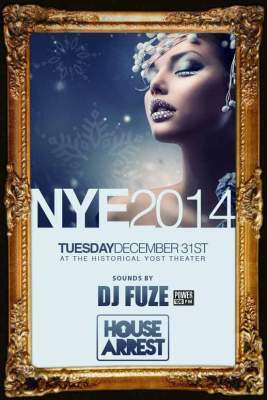 Tuesday, December 31 – Yost Theater + Bia2.com Present: NYE 2014. Sounds by: DJ Fuze (Power 106) House Arrest. Doors: 9:30pm. $20 General Presale • 21+. **Special Offer** Buy 3 Tickets – Get 1 Free. Buy Tickets. New Year’s Eve Concert Featuring Soulful Singer J Boog, Los Rakas & Bayonics– House of Blues – Anaheim (Anaheim, CA). Cap off 2013 with this concert at the House of Blues in Anaheim featuring soulful singer J Boog, bilingual hip-hop duo Los Rakas and Latin hip-hop group Bayonics. A singer of Samoan descent, J Boog’s 2007 debut album Hear Me Roar introduced the smooth, breezy crooner to the world, and a series of concerts through the U.S. and beyond have cemented his reputation as a world-class performer. He’s joined by Los Rakas, a hip-hop/raggaeton group featuring Panamanian cousins Raka Rich and Raka Dun, along with 10-piece Latin, hip-hop and funk powerhouse collective Bayonics. Click here to buy tickets for $20 instead of the $40 full price. Ducks Host Sharks: Early-Evening Hockey on New Year’s Eve. Honda Center of Anaheim, formerly Arrowhead Pond (1612 S Douglass Road Anaheim, CA 92806). It’s Northern California vs. Southern California as two of the NHL’s best teams face off on the last day of the year. The Ducks have been one of the league’s best teams this year, challenging for the Western Conference lead. Star forwards Corey Perry and Ryan Getzlaf have led the charge for the Ducks. They face a tough challenge from the Sharks, who have been nearly unstoppable this year. Rookie star Tomas Hertl has joined Joe Thornton, Patrick Marleau, Logan Couture and Joe Pavelski to make the Sharks’ offense even stronger. This game may be a preview of a crucial playoff series this year, and you can see it in person at the Honda Center. Click here to buy discounted tickets from $18.00 – $56.00. Additional fees apply. New Year’s Eve Steak and Lobster dinner at Sealegs Wine Bar, located at 21022 Beach Blvd. #105, in Huntington Beach. Dinner includes Moet and Chandon Champagne, Dessert Bar, and bottomless champagne. Live Entertainment with DJ Peter G. Dinner for one is $100. Dinner for two is $175. Click here to make reservations. Medieval Times New Year’s Eve Extravaganza. Ring in the New Year with the lords and ladies of Medieval Times. The evening begins with the famed Medieval Times experience. You’ll be treated to pre-show hors d’oeuvres and can explore the hair-raising Museum of Torture as you arrive. At show time, settle in to enjoy a four-course banquet and cheer for your favorite knight. The chivalrous warriors compete in jousting, swordsmanship, thrilling hand-to-hand combat and displays of extraordinary horsemanship. After the show, medieval times give way to modern times with a DJ and dancing, party favors, a champagne toast and balloon drop at midnight. After your night of partying, restore your energy with a continental breakfast. Click here to buy discounted tickets from $29.28 – $49.75* * Additional fees apply. Located at 7662 Beach Blvd Buena Park. Celebrate the new year safely and let us do the driving! OCTA is offering FREE rides on all fixed-route buses from 6:00 p.m. on Tuesday, Dec. 31, 2013 until 2:30 a.m.* on Wednesday, Jan. 1, 2014.